Poll watchers reported only a scattering of problems with voting machines, mostly in the morning. Otherwise, the election appeared to go smoothly throughout the Philadelphia area. As a result, what problems did develop generated considerable media attention, but they ranged between minor and farcical. Earlier in the day, for example, several Republican poll workers were asked to leave their polling places. Reports varied as to why  either they lacked proper credentials or the polling place was too crowded to accommodate them. In either case, a city judge promptly ordered them returned to the polling places, according to state party officials. More colorfully, a pair of men dressed in the militant uniform of the Black Panthers  berets, dark shades, military-style jackets, pants and boots  appeared in front of a polling place in a predominantly black area of north Philadelphia around midday. One man was reportedly armed with a nightstick, but he was asked to leave by police, who had been summoned by a Republican poll watcher. By mid-afternoon, as media began to gather, one uniformed but unarmed man remained, handing out literature to voters, but he angrily refused to answer any questions. A credentialed Obama poll worker, who identified himself as James Orman, said the uniformed man was a representative of the Obama campaign, though he curtly refused to answer any additional questions or identify the uniformed man by name. He advised the uniformed man not to say anything further to the press. See the Top 10 ballot measures. An Obama volunteer from the precinct told political blog Talking Points Memo that there had been no voter intimidation by the men, and indeed, McCain workers seemed to be baiting the Panthers by taking their photos before police arrived. The volunteer also said the man was a fully credentialed poll watcher. And by mid-afternoon, when TIME arrived, the remaining Panther did not seem to be making any effort to stop people from approaching the building, although he maintained a stiff and formal expression on his face and stood with a military bearing when not handing out literature. The situation drew the attention of conservative media like Fox News, as well as Republican attorney Lovida H. Coleman Jr., a member of Lawyers for McCain, who showed up on the scene to observe. The mens' dress  particularly the nightstick  "was very militaristic and could have been very intimidating," she said. "I don't think someone would be wearing that garb in front of a voting machine without the intent to send a message." She admitted, however, that "after talking to people, I haven't found evidence of specific harm to individuals." While she was talking with the press in front of the polling place, in the cafeteria of an apartment building, a man who identified himself as a representative of the city's District Attorney showed up, spoke briefly with the Democratic poll workers and left, saying there was "no situation here" and advising reporters to stay away from the uniformed man. Election watchdog group The Committee of 70 reported at mid-afternoon that they were seeing only a handful of problems in the area, including poll workers who were improperly demanding driver's licenses from all voters at a crowded precinct in Chinatown, and a precinct in Northeast Philadelphia where the voter logs inexplicably excluded all names starting with letters Aa through Aj. John McCain's Florida campaign director, Arlene DiBenigno, just got an election-day boost from Havana. To win the nation's largest swing state, it's imperative that McCain hold on to South Florida's Cuban-American votes, which usually swing strongly Republican but which Democrats believe they can divide this year. Those voters may have gotten an added impetus to go for McCain a few hours ago when Fidel Castro, Cuba's ailing ex-President and scourge of the Miami exile community, voiced praise for (but didn't outright endorse) Obama: "Without a doubt," Castro wrote this morning in Cuba's state-controlled media, "Obama is more intelligent, cultured and levelheaded" than McCain. DiBenigno, a Cuban American and daughter of exiles, tells TIME, "Castro has done us a big favor." But DeBenigno says it was an unnecessary one. "We're going to win Florida," she says. 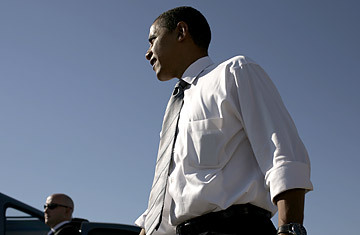 "It will be a nail-biter, but our ground game and absentee ballot organization will prove better than Obama's. [Obama] might spend $20 million here, but McCain has 20 years of experience that crosses over into every community in this state, especially Cuban Americans." She believes that informal voter surveys today show Florida's Cuban-American vote is holding steady enough for McCain to give him the state, where Obama has actually held a slight lead in the polls in recent weeks. And she rejects this year's popular media notion that the Cuban-American vote is somehow splitting between older, more hardline exiles and a younger, more moderate generation. At a raucous midnight rally at the University of Miami this week, DiBenigno notes, some 8,000 people turned out, and many were young Cuban Americans, "dancing and swaying to the same music their parents and grandparents listen to" as well as sharing the same political concerns. That includes, she argues, their ardent opposition to any kind of dialogue with the Castros, which Obama might be more open to. "And don't forget what 'redistribution of wealth' means to Cuban Americans," DiBenigno adds. "It means the kind of policies that came to power in Cuba in 1959. That's why we're seeing a higher surge of support for McCain among Cuban Americans right now. It's also heightened the younger voters' understanding of what democracy is really all about." If DiBenigno, 42, is right about the solidifying of the Cuban vote, then trends in the middle of the state, especially along the all-important I-4 Corridor, and the north, where regions like the northwest Panhandle are very reliable GOP terrain, would indeed bode well for McCain in Florida. "Our chances look very good right now," says DiBenigno, who has come under criticism among Republicans the past couple months for McCain's slip in the Florida polls, but whose counsel and on-the-ground knowledge, say backers, has too often been ignored by the McCain campaign's national bosses. "The Senator's economic message has struck a chord with small-business owners here  Jose the Plumber, if you will." And that includes non-Cuban Latinos, she insists, who polls suggest could trend McCain's way in Florida because of their conservative stances on social issues like abortion.